When you blow across the open end of a bottle, you hear the sound of certain frequency. If you shorten the length of the air column in the bottle by pouring some water into the bottle, the sound you hear has higher frequency. The sound of your blow without the bottle is much weaker and more nosier than the sound you hear with the bottle. The length of a pipe determines the resonant frequencies selected by the pipe; the longer the pipe the lower the frequency of its fundamental mode. In organs, for example, sounds of different frequencies is produced by using pipes of different length, with some being open at both ends, other open at one end only. When a key is pressed on the console of an organ, air is forced through a narrow opening into a given pipe and a sound with characteristics frequencies is heard from that pipe. Forcing air through a narrow opening is one way of producing sound with a continuous band of frequencies and without the pipe you hear it as a noise. 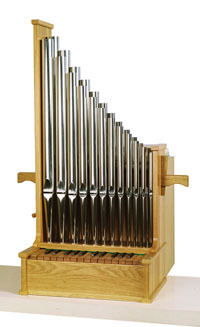 Sound resonance in air columns plays an important role in producing sounds in some musical instruments such as organs. In these instruments, a sound which is a superposition of a continuous band of frequencies is generated and sent through a pipe which reinforces only certain frequencies, the resonant frequencies. Usually, without the help of the pipe, the sound from the source is not loud enough to be heard over long distances. The pipe reinforces waves with the resonant frequencies and channels more of the source energy into these waves making them very pronounce and loud compared to other waves of the source. Usually most of the sound energy goes into the fundamental mode, then to the second second harmonic and so on.